Ok, just wanted to check in so you guys wouldn't think I totaly forgor about you , and I hope I'll find more time for you. Thanks to a friend the boys and I are watching The Big Bang Theory on dvd. We borrowed the first 3 seasons and are enjoying it. The boys have one more day of school before winter break and I have two more days. This year Fall has dragged while going fast. On Sunday, ds#1 will turn 15. We LOVE The Big Bang Theory. It is one of the few show everyone here likes. 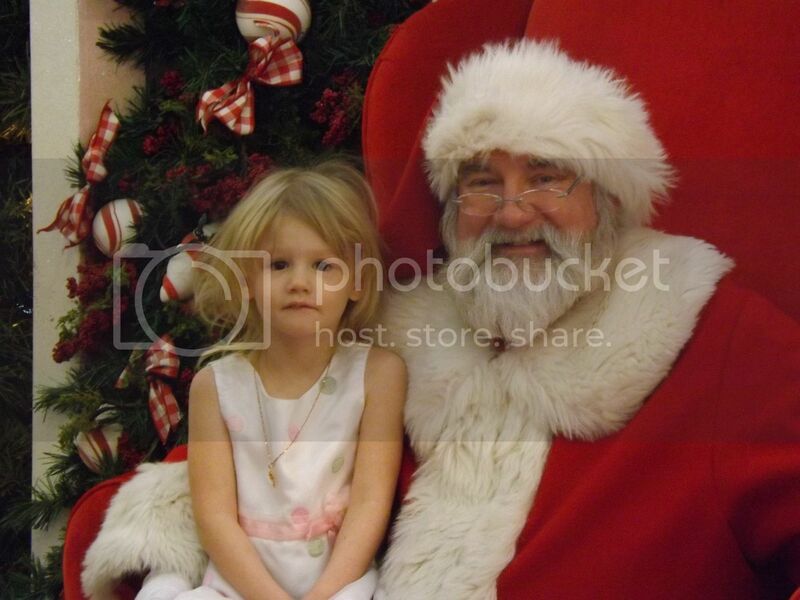 4 year old Emmi, my niece, with Santa Clause. I got a larger picture of Kibby to load up. I officially now have a 15 and 13 year old...how the time flies. We went to our friends annual Christmas Brunch for Jews which includes delicious food like Kugel, bagels (ds#2's favorite), couscous salad and so much more. We had a great time as usual. Ds#1 birthday/Chanukah present from mom this year is his letterman jacket. He lettered in Cross-Country along with receiving his scholar athlete pin. I replace ds#2's 3-D Ds (it was stolen about a month ago) for Chanukah. I hope everyone who celebrates Christmas had a beautiful and joyous holiday! Tell him congratulation from us! How sad that something got stolen, but I'm glad to he had it replaced, I was thinking of you and another friend who is celebrating Chanukah. I know Ginnystar. When he called and told me my heart broke for him. 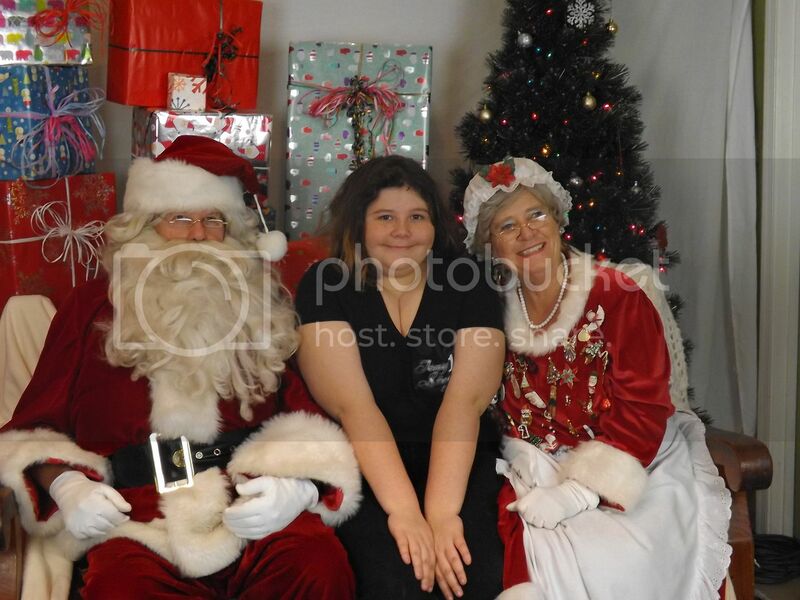 How was your Christmas? We spent New Years Eve with friends and had a blast. I actually stayed up to see the New Year in which I've not done in years. It was fun. Hope up you had a nice holiday, Moonlady. I made a calender for here, I will print it out later and take get it bound next time I go to Lynchburg. I think it came out fairly well. I've had limited Internet access for the past several months, and the past week has been crazy. At the beginning of October, my grandmother had a very serious stroke. She lost her speech and all movement on her right side. In the middle of December, she caught pneumonia, and sadly, we lost her at about 1am in the morning on the 28th, just after she turned 74. So, sadly, my the beginning of my 2013 has a funeral. A lot of that has to do with all the family who has to come from out of state. So, here's hoping that the rest of 2013 is better than the beginning of it. Sorry to hear about your grandmother. I hope the rest of the year is better. I'm sorry about your gran, R2005. I wish you and your relatives the strength to cope with this loss. For a gran she died much too young. I hope you have great memories of her. I have 26 years worth of good memories of my grandmother, reading with her, planting things in her garden, going out to lunch on Saturdays, and every single Christmas that I can remember, etc. I'm going to miss her, but it makes it easier knowing that she's not suffering anymore. My grandmother was a woman who loved to talk and tell stories. After the stroke caused her to lose her ability to communicate, all of us thought that this was probably one of the most frustrating things to happen out of the whole situation. The people I feel the most sorry for are my five younger cousins, the oldest will turn 10 this March, and the youngest was only born this past September. Fortunately, my aunt brought her up here to see my grandmother while my grandmother was still responsive to what was going on around her, so there will always be one picture of that newest little girl with her grandmother. That cute baby will never know either of grandmothers, though since my aunt's mother-in-law passed away in 2011. It is cold and wet here. Cats do not want to go out due to the wet part. They are driving us bonkers, along with the dogs and each other. They want to play so are running around at full speed trying to find something or someone to attac. I am going to be mean and throw them all out and block the door so they can not come back in. Not that I would really do that. It is tempting. Back to work and school here. Ds#1 seems to enjoy the track more than I ever did in high school. I ran track to stay in shape for Cross Country. Ds#2 is venting about his school friends. I am listening to him because there is nothing I can do about it. They are frustrating him because of some of the things they say to him. I encourage him to express his feelings to them but he said it doesn't help. It seems he has friendship issues I don't remember having. So far being a teenage boy seems a lot harder than a girl. Last Monday around 3 AM, my yahoo email addy was hacked. The hacker deleted my contacts making it very hard to let people know. I quickly regained control of my account but cleaning up the mess has taken longer. We got 3 inches of snow yesterday. It even thundered, I don't think I have ever heard thunder during a snow storm before. 0 degrees F (almost -18C for the Celsius folks). Brrrrrrr! Between 0 and -10 here with a modest layer of snow that is still there but with higher temps foreseen for after the weekend. Despite a possible thaw setting in the Dutch mind are set on skating and their traditional long range skating events. I have been having to pour hot water in the gaots water pool. It keeps frezzing over. Luckily it is located under Mom's window so I do not have to go outside. Which is why I put it there. It is the size of a small fish pond. That is what it is made for. Why not buy a cheap heat tape, like you put on pipes to keep them from freezing and duct tape it to the pool? They actually have a small thermostat on them so they only come on when it's freezing and below, they're waterproof, and they come in various lengths. Even one too short to go all the way around should keep the pool from completely freezing. My mom used one on her dog's water bucket for years outdoors in St. Louis. Had to replace the duct tape every so often, but the tape lasted quite a while. Hi all!! Been gone for awhile. Changed jobs and it was a big change. I went from working in a lab with students in the sign language program and decided I needed a change. Had been there for 14 years. Now I am working at the same school but am a police dispatcher. Was in training for 3 months. It was very rigorous. I am still taking more training but am at least officially working. I am liking the new job. :-) Just needed a change. Now have some more time to come back to the things I enjoy, like some very long put aside reading. Hope all are doing well! Wow! I won't complain about our weather but I'm glad that we are not that cold. However, one day I will hopefully visit everyone during the spring. It's not cold here - in fact, I had a fan on all night last night to keep it cool enough to sleep - and we're watering fruit trees to keep the fruit on them. The weather forecast is for it to stay dry at least until the end of the month. No 1 son has returned from Switzerland with his partner and two children - it was great to see them. And a nephew got married in Australia, then came here as part of his honeymoon, so we had a big party at the local pub. About 40 people there, and the first time in ages that we've had my mother and all 8 of the siblings together, along with most of the local grandchildren and some great-grandchildren. A good time was had by all. The heat tape is a good idea, if I can fiure out a way to keep him from eating it. He will eat almost anything. Yeah, that's definitely not a problem my mom had with her dog. On a quite smaller scale, I have a stainless water pan for my dogs that's heated. The water doesn't ever get warm, just not frozen. The electrical cord is armored, as in wire-wrapped, to prevent chewing. I've had it several years, so I can't tell you what I paid for it. I think I bought it at Orscheln's.... that's a farm & home store, in case you don't have that name in your part of the country. But anyway, I don't remember it as being a Walmart-type item, which means it was probably over $20, maybe in the neighborhood of $30. It holds slightly less than a gallon of water and resembles a dog's food bowl. But let me emphasise that the water has NEVER frozen. I bowled with ds#2, a friend and her daughter and confirmed my lack of bowling skills. Ds#2 was the only one giving her any competition. At one point, I joke about gutter balls being the family heritage but it skipped ds#2. A LONG time ago I was in a bowling league. My average was 97 in the end. Mother in law has competed in national competition. She did not win, but did well enough to get some money. Well. The boy scouts are on the verge of what I hope will be an historic decision. About time! I don't see anything in there that would exclude any person on the basis of his sexual orientation. And yes, I've been a boy scout and leader myself. Absolutely, Hans. My brother was a scout, and also an Eagle Scout. I'm sure if he was still here he'd be supporting this change! I agree Hans and Cilla. I also have a large hook, and it end up in the gutter just before it hits the pins. I was a Girl Scout, and if the troop was closer, I would have continue, I could have become a Lone Girl Scout, but classes were taking more out of me. Today was my husband's last day at work. He isn't officially retired until tomorrow, but that's his day off, so he is actually done! YAY! !